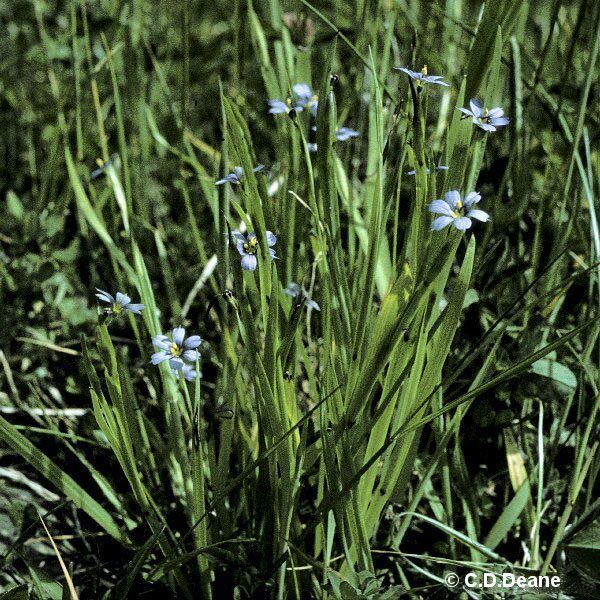 Blue-eyed grass is a small, tufted perennial of wet pastures, lake shores and grass verges that is widespread in North America and has its European presence principally in Ireland. Due to classification and naming problems, the status of the species in Ireland is not absolutely certain. It has been taken as being native since its discovery in western Ireland in 1845, and until proven otherwise by further studies, this may really be the case. The main causes of the species decline are agricultural improvement, habitat fragmentation, overgrazing or cessation of grazing and drainage programmes. Despite the name ‘blue-eyed grass’ this species is related to the irises but it does have relatively narrow, grass-like leaves that form a miniature fan and which sometimes develop into a tuft or clump in well-established plants. The small, star-like, pale to bright blue flowers with their contrasting yellow centres open only in bright sunlight. Flowers are produced from June to August and each one lasts only a day or two. A perennial, it grows up to a maximum of 40cm tall, although is often only half this height. Under favourable conditions it flowers in the same year it germinates. Although the flowers are short-lived, the species is self-compatible and must regularly self-pollinate since it generally seeds very freely. 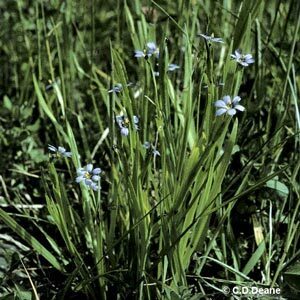 In good growing conditions blue-eyed grass can become locally abundant, spreading in an invasive weedy manner. Seed probably persists in the soil seed bank, but for how long is unknown. The plant often possesses a short thickened, horizontal underground stem which provides food storage over the winter period, and this also allows the individual plant to increase in size and form a tight clump. 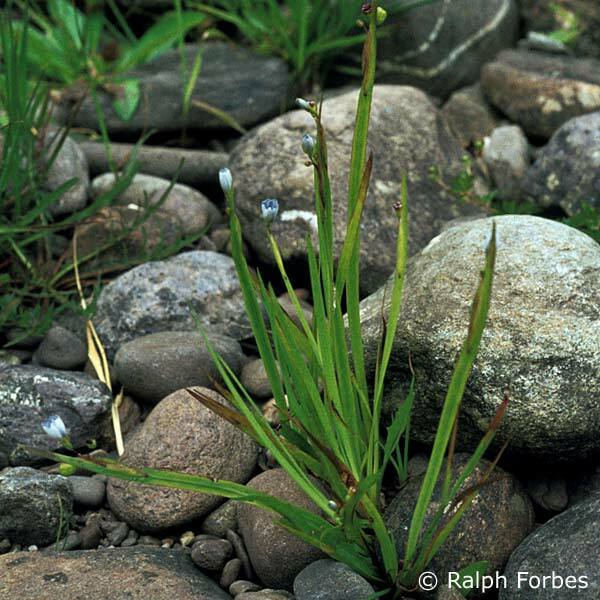 The wild form of blue-eyed grass has five or six close relatives, and as a result the botanical classification, true identity and correct name of our plant have been and remain a source of confusion and doubt. 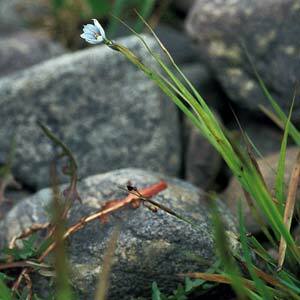 However, we do know that it is definitely different from the cultivated forms the gardener calls "blue-eyed grass". 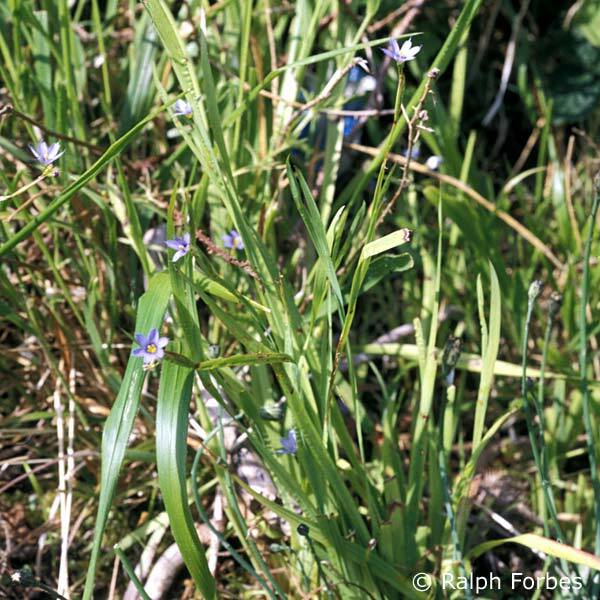 S. montanum has bright or deep violet-blue flowers like S. bermudiana and is the only species in Britain and Ireland which could be confused with wild blue-eyed grass. S. montanum does escape from gardens in both Britain and Ireland, while S. bermudiana has such a pale-coloured flower it is scarcely "garden worthy". Apart from the difference in flower colour the fruit of S. bermudiana hangs and dangles while that of S. montanum is held stiffly erect. Blue-eyed grass is very local in Northern Ireland, being almost exclusively confined to wet pastures, shallow sloping lake shores, and along grassy roadside verges in a few areas in the Lough Erne and western plateau regions of Fermanagh. The small pale-blue flowers only open on bright, sunny, midsummer days, which means that the species is very easily overlooked. 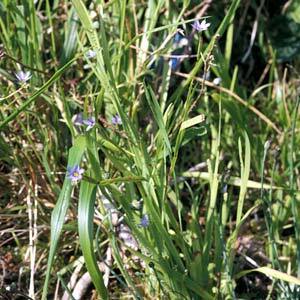 Blue-eyed grass is restricted to sites around Lough Erne and Lough Melvin in County Fermanagh. It has been seen in five of its nine Upper Lough Erne tetrads (2 kilometre squares) in the post-1975 period, and is known in an additional nine tetrads scattered elsewhere in the county. The species is protected under Schedule 8 of the Wildlife (Northern Ireland) Order 1985. 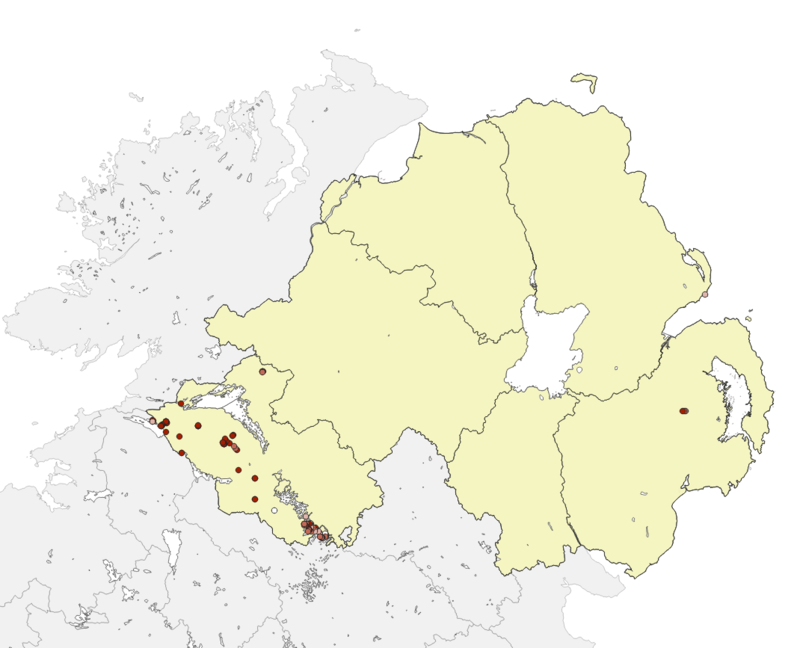 It is scarce and has declined, with the UK population restricted to Northern Ireland. It is also listed in the Irish Red Data Book for vascular plants. Most populations of this species are small and genetically isolated with little or no pollen transfer. Long term inbreeding will further erode population variation making adaptation and recovery more difficult under pressure from competition, disease, pollution or nutrient enrichment by slurry, herbicides or fertilisers. Small populations are susceptible to chance extreme events, including trampling, over- or undergrazing, drainage, flooding or prolonged drought. There is a Northern Ireland Species Action Plan which was published in 2005. Implementation of the Northern Ireland Habitat Action Plan for Purple Moor Grass and Rush Pastures. By 2015, increase the range of S. bermudiana to six 10x10 km squares. Visitors to sites where the species grows must avoid excessive trampling or any other form of disturbance of the local surroundings. Fitter, R., Fitter, A. & Blamey, M. (1996). Wild Flowers of Britain and Northern Europe. Collins Pocket Guide 5th edition, HarperCollins, London. Hill, L.M. (1983). Chromosomal typification of Sisyrinchium bermudiana L. (Iridaceae). Rhodora 85 257-258. Ingram, R. (1967). On the identity of the Irish populations of Sisyrinchium. Watsonia 6 283-289. Ingram, R. (1968). Breeding barriers in some species of Sisyrinchium. New Phytologist 67 197-204. Löve, A. and Löve, D. (1958). The American Element in the Flora of the British Isles. Botaniska Notiser, Lund 111(1) 376-388. Perring, F.H. (1962). The Irish Problem. Proc. Bournemouth Nat. Sci. Soc. 52 36-47. Sell, P. and Murrell, G. (1996). Flora of Great Britain and Ireland, Volume 5, Butomaceae - Orchidaceae. Cambridge University Press, Cambridge. Ward, D.B. (1968). The nomenclature of Sisyrinchium bermudiana and related North American species. Taxon 17 270-276.